When I went into the supermarket in Northampton to buy the sugar for the hedgerow jelly I noticed they had samphire in the fresh produce section. I’ve been reading about samphire for some years now and had always wanted to try it so although I was supposed to be running down the food supplies aboard narrowboat Patience I decided I HAD to buy some samphire. Of course I had no clue how one was supposed to cook samphire – if one even cooked it at all. But what I did know was that I was definitely going to make it work with the ingredients we had on the boat. 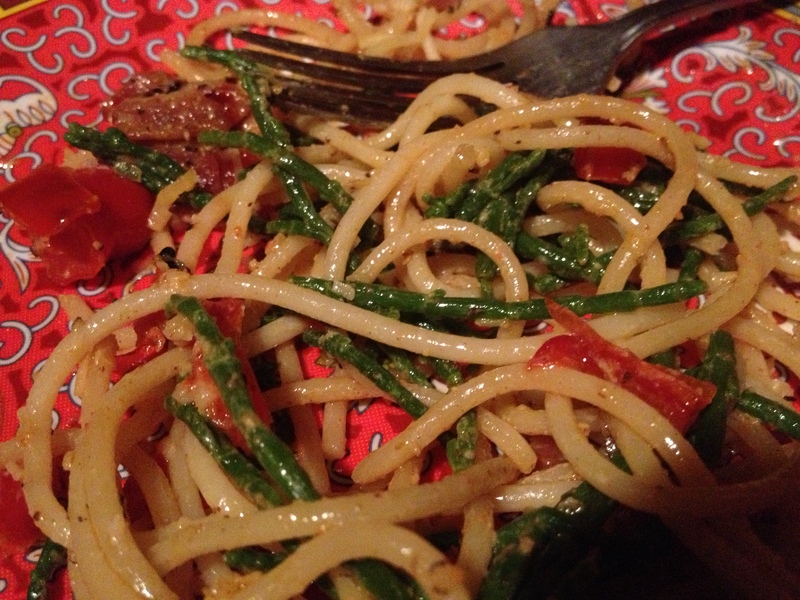 Another quick Google search told me that samphire mixes really very nicely with spaghetti(which we had in the galley) and Hugh came up with ideal cooking method – ‘Add the samphire to the pasta pan for the last two minutes of cooking time.’ I improvised with the rest of the recipe by frying bacon, garlic, a shallot and red peppers to which added a little leftover cream and let it bubble and reduce. I then tossed the sauce lightly with the spaghetti samphire mix and served it with some parmesan and lots of black pepper. And what I do know now is that I love that salty, crunchy, green gem of a plant. I have to get back to the UK for the next samphire season!